Below are resources and information to help you prepare for an emergency. View the Roanoke County Floodplain App to see a rendering of Roanoke County's floodways. You can search by Roanoke County street address or owner name. Select the layers to see floodways, 100 year floodplain, and the 500 year floodplain. Crisis Cleanup has established a toll-free 1-800 number for citizens needing assistance with cleaning up after the storm. Hurricane Florence Home Cleanup Hotline: 1-800-451-1954 to request help from voluntary agencies. Learn more at the Crisis Cleanup website. Clear out your roof gutters. Remove leaves and debris from storm drain inlets or ditch lines near your property. Elevate all valuable items off of the ground, particularly in basements. If you have to evacuate, unplug all appliances and electronics and turn off electricity at the main electrical box before leaving. 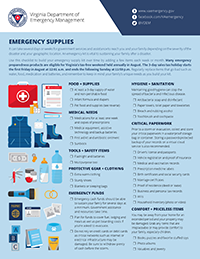 Download Emergency Preparedness Booklets provided by the Office of Refugee Resettlement translated in English, Amharic, Arabic, Burmese, Chinese, Farsi, French, Nepali, Somali, Tibetan, Tigrinya, Swahili, Kinyarwanda, Sgaw Karen, and Karenni.